These were taken at the weekend the morning after we had a little snow! I'm really not a fan of snow (the ice that follows is treacherous for a person as clumsy as me) but it does make for a nice photograph, that much cannot be denied! I am, of course, sporting my new wardrobe staple in the form of a studded denim jacket - the full DIY post is here; I literally cannot get enough of it! I also gave my faux fur stole from New Look it's first outing - I'm not entirely sure why I haven't worn it before! In other unrelated news, I was lucky enough to go along to watch the Britain's Got Talent auditions last night with two of my friends! The stars were clearly aligned for us, as we managed to get tickets for the very front row of seats directly next to Simon Cowell himself - he even shook my hand and gave us a cheeky wave and a wink (which I ever so sneakily managed to catch on video!). We also shook hands with judges David Walliams, Alesha Dixon and Carmen Alectra who was standing in for Amanda. The absolute highlight of the evening was when Ant and Dec came on stage and spoke directly to us as a result of our girlish screams, talk about starstruck! It was a fantastic evening full of laughs at diabolical acts and standing ovations at ones that were actually pretty good. It was so interesting to see how shows such as BGT work behind the scenes (so much is set up, let me tell you); I heckled myself hoarse, cringed at some deluded auditionees and mingled with some celebrities which of course is never a bad thing! Lastly, I am so excited because this weekend I leave for a school trip to Spain for half-term! Although the weather forecast for where we're going isn't great, I'm sure we will all have a great time. Obviously due to this I will not be posting much next week, however I may well set up one or two scheduled posts - I cannot guarantee this though as I'm not sure I'll have time on Saturday to write posts and pack and do all the other millions of things that are on the agenda! If this is the case, then apologies. Hope you've all had a lovely week, and are looking forward to the weekend (and/or half-term) as much as I am! Such a cute outfit, but weren't you you cold me dear? Hope you had a nice cuppa or hot coco to warm your up. Bless ya little cotton socks. You always look so effortlessly pretty, you look gorgeous with your hair up and i love the jacket! You were so lucky to see ant and Dec, i love Dec! ahah! Have fun on your trip to spain! Lucky you sounds like a lot of fun! Love your outfit. My bf was looking over my shoulder and said thats a cool pic! awesome outfit. 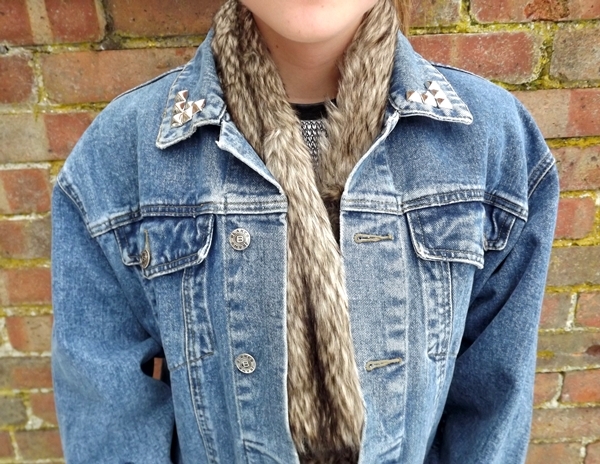 I love the diy studs on the jean jacket!! !